Giovanni Antonio Canal Canaletto The Old Horseguards from St James's Park (c.1749) was purchased by the Andrew Lloyd Webber Foundation in 1992. Since that time this exceptional work of art has been on exhibition at museums throughout the UK and is currently on long-term loan and permanent display at Tate Britain, London. During 2015-16, this work was included in the Compton Verney Museum and Art Gallery exhibition Canaletto - Celebrating Britain, March 2015 - February 2016. The exhibition toured to Holburne Museum, Bath and Abbot Hall Museum, Kendal. In June 2016, the picture was included in Christie's 250th anniversary exhibition Defining British Art held in Christie's newly opened exhibition space at King Street, London SW1. The picture returned to Tate Britain in September 2016. Among the two dozen or so views of London that Canaletto produced, this is one of the largest and most spectacular. 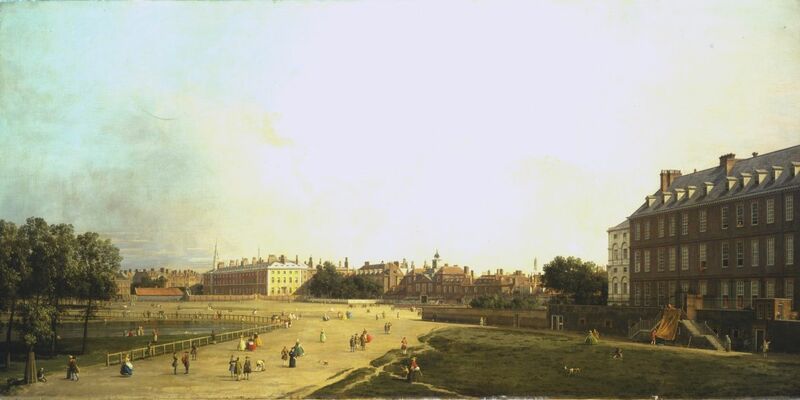 It commemorates the last remnant of Stuart Whitehall before its demolition in 1750, to be replaced by the present New Horse Guards (which Canaletto also painted). The decayed brick buildings are flanked by the proud new structures of the Georgian age: the Admiralty on the left, with the spire of St Martin’s behind, and, on the right, a glimpse of the York Buildings water tower and William Kent’s Treasury, with the grand residences of Downing Street in the foreground. Peopled with innumerable precisely characterised figures, both rich and poor, with the Guards drilling on the parade ground, servants going about their business, men relieving themselves against any available wall and children playing by the Canal, St James presents a delightfully well-observed slice of daily life in London.